There can be some really exciting days when you’re building a SaaS company, but the large majority are a slog. Just one foot in front of the other, slowly trudging your way up the hill in the muck. The hockey-stick growth you’ve envisioned feels laughably far away. Amazingly, you are growing every month, but it’s just…so…tedious. This, my friends, is the long, slow SaaS ramp of death. It’s perfectly normal and par for the course for the large majority of SaaS companies. Back in 2013, Gail Goodman, who at the time was CEO of Constant Contact, gave an amazing talk at the Business of Software conference where she aptly described building a SaaS company as the “long, slow, SaaS ramp of death”. Her talk is very much worth your time. We all start things because we believe there’s a need. There’s some problem and we’ve got the solution. Founders are nearly universally optimistic…many times to our own detriment. We believe growth will be amazing, but turns out for most it’s incredibly slow and most times erratic. So how should you deal with that? It really is maddening and can lead to making a lot of decisions that hurt more than help. Here are some things to keep in mind and tips to help you as you traverse the long, slow, SaaS ramp of death. Right out of the gate, you almost certainly have unrealistic expectations. Every one of us is influenced in some way by hype and sensationalism. Mix the tech news cycle with a healthy dose of overoptimism and you’ll find yourself believing you’ll be on some record-breaking growth trajectory “any day now”. Reset those expectations. Understand that not only are the crazy growth stories you read about exceedingly rare, many times they’re just downright irrelevant. You aren’t building the next Facebook or Uber or whatever “unicorn” you’ve read about so stop letting their stories influence yours. This may sound like heresy, coming from a guy who sells real-time business analytics for a living but you should ignore nearly all “real-time” anythings. There’s a time a place for responding to individual customer actions, but rarely should you, the founder, be the one to do that. When you obsess over every single customer interaction, every cancellation, downgrade, new trial or whatever other anxiety-inducing movement, your judgement gets clouded. You start finding trends where there aren’t any (“Cancellations are through the roof OMGBBQ!!!!”). You need to take a step back and view data on a macro level, not micro. As the founder, you should care more about the trends not the constant, inexplainable anomalies. As much as you’d like, that next feature you’re working tirelessly on simply will not change your growth trajectory. If you’re a designer or developer by trade, it’s easy to think that spending a couple of hours/days/weeks building something will be what turns your business around. It’s dangerous because it feels like progress. You’re doing something, right? But you’re likely ignoring the core issues if you’re just cranking out feature after feature while neglecting other parts of your business. The large majority of your expenses will be payroll. Nitpicking all the tiny monthly charges you have just doesn’t matter. Hiring folks will quickly drain your bank account if you aren’t careful. Sure, you may not need a huge team to run your business, but you will need some people and properly accounting for payroll and when you’ll need to hire is crucial as you grow revenue. In B2B companies, a frequent problem is actually having enough data to make a data-influenced decision. It’s extremely distracting to, for instance, look at user churn on a plan, see that it’s “25%” and promptly freak out and think that plan is terrible. But what if you’ve only got 5 users on that plan? You don’t have any where close to enough data to take action or even entertain the “25%” figure. And that scenario exists across the large majority of any number related to any part of your business. Context is extremely important, otherwise you’ll make rash decisions. One of the really frustrating parts of running a business is that many times we just don’t know the answer to “why?”. Why did churn go up 10%? Why are trial conversions decreasing? Where did all these new users come from? Why is our growth half of what it was last month? Many of those questions have no answer and trying to find an answer will cause you to rip your hair out. Instead, you’re better off giving your business some time and space. Let it breathe a little. There are so many external factors you have no control over nor do you even have the ability to pinpoint because they’re just so minute. Many times you just need to wait. If a given metric is concerning to you, give it a few weeks or even a month or two and just wait and see what happens. Your business is made up of anomalies, not fully predictable and linear connections between A and B. 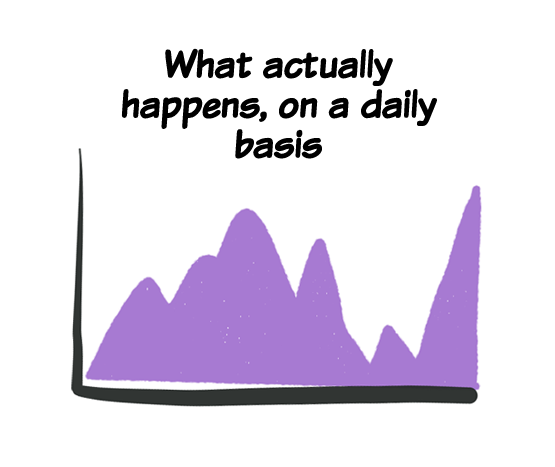 In our handy little chart early, we showed what happens when you zoom in on any given day. It’s so erratic and stress-inducing. For many businesses, that may actually be what your weekly or even monthly revenue charts look like. It can help tremendously to take action and stabilize those a bit so the business isn’t susceptible to a bad month here and there and so you can simply sleep better at night. Two really great ways to stabilize your business are with annual contracts and with a generous amount of savings in the bank. Annual contracts give you two big wins: they reduce churn (as the customer is committing to a full year) and they give you cash to fuel growth. Having 3-6 months of expenses sitting in the bank can feel like a bad use of money (“Imagine all the things we could do with the hundreds of thousands or even millions of dollars sitting there!”) but the fact is, something will happen. And when that something happens, you’ll be much better equipped to weather the storm and come out on top. Savings are essentially insurance against the infinite unknown. Long, slow SaaS ramp of reality? In talking to lots of other founders about this topic, quite a few mentioned the term coming off as negative (namely the “…of death” part). A number suggested maybe call it the ramp of reality or success instead. It’s what most businesses face and experience and many times, that slow ramp is actually a sign of success. It shows long term stability verses a flash in the pan that can’t be sustained. So while your growth may be slow and may not be at a level you want, understand that strong businesses are a long game and instead of agonizing over what your business isn’t focus and enjoy what it is.